Carla Neumann-Hinds was born in Germany and studied art and photography at the Academy of Art in Leipzig. For many years, she worked as a photojournalist and freelance artist; she later went back to school to pursue her growing interest in education. Carla is now a teacher at a private school in Barbados. She believes that the integration of art and photography in teaching is very useful in supporting children's learning in all subjects; as a teacher, she strives to use creativity and connect her passion of art and photography with innovative methods of teaching. 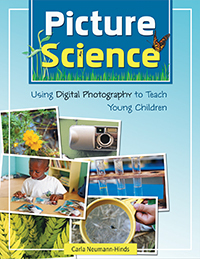 Make digital photography an important part of your early childhood program! Young children love to investigate the natural world, and they love to take photographs.